The “Deuce” or 2x card is an alliance reference to various street gangs that are affiated with the NeighborHood Crips as well as Rollin 0’s card. The majority of the sets affiated with the Deuce (2x) card are produced by the West Side Crips gang. A number of Deuces (2x) cliques are also allied with the Blocc Crips, which is an totally a separate Crip card. Street organizations that are aligned with the “Deuce (2x)” card has been in conflict with “Tray (3x)” gangs also known as the Gangster Crips gangs ever since the 1970s. This feud accounts for the majority of Crip on Crip bloodshed throughout L.A. Region. Crip syndicates which represent the Deuce(2x) card consists of: Neighbor Hood Crips and Rollin 0s, Rollin 100s Crips, Hard Time Hustler Crips, East Coast Crips, Mafia Crips, West Boulevard Crips, Geer Gang Crips, and the Raymond Avenue Crips. As soon as the conflict between the Rollin 60s Neighborhood Crips and the Eight Tray Gangster Crips began in 1979, neighborhood gangs east and west of the 110 Freeway in Los Angeles found themselves choosing sides and aligning themselves with either one of the two super gangs. 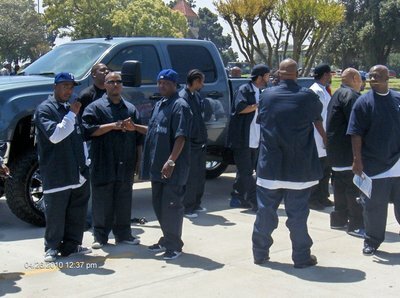 Most neighborhoods east of the 110 Freeway were friendly towards the Eight Tray Gangster Crips and adopted the Gangster Crips card and joined them in battling all NeighborHood Crips in addition to all Bloods.